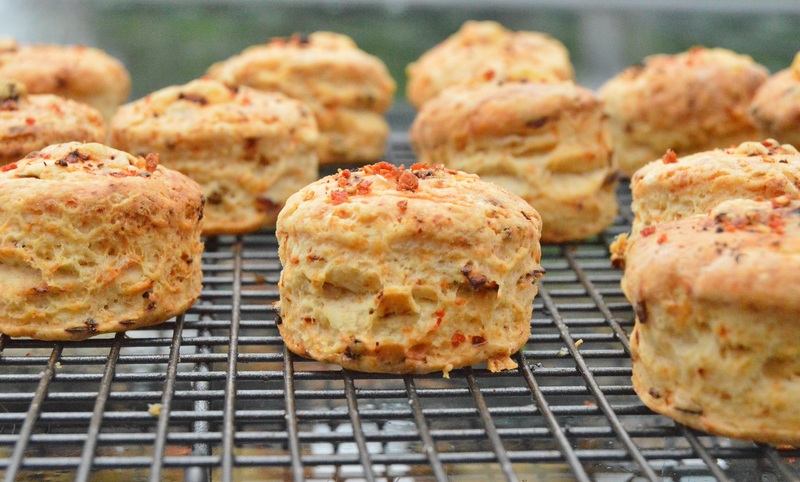 The dough for these particular scones is flavoured with sun-dried tomatoes and a little mature Cheddar. These are ideal split and topped with a fresh herbed cream cheese (chopped basil is wonderful!) and home-made chutney or chilli jam. 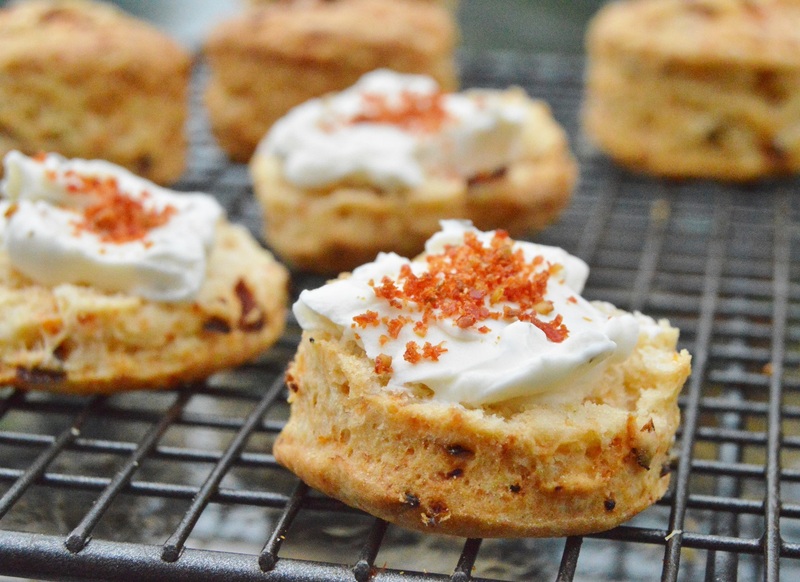 These savoury scones are very easy to make and are big on flavour. They make a wonderful snack or, if served with a salad, some sliced meats, olives and the like make a great light meal. These are excellent served as canapés using a 4cm cutter (or an upturned shot glass to stamp out the scones!) 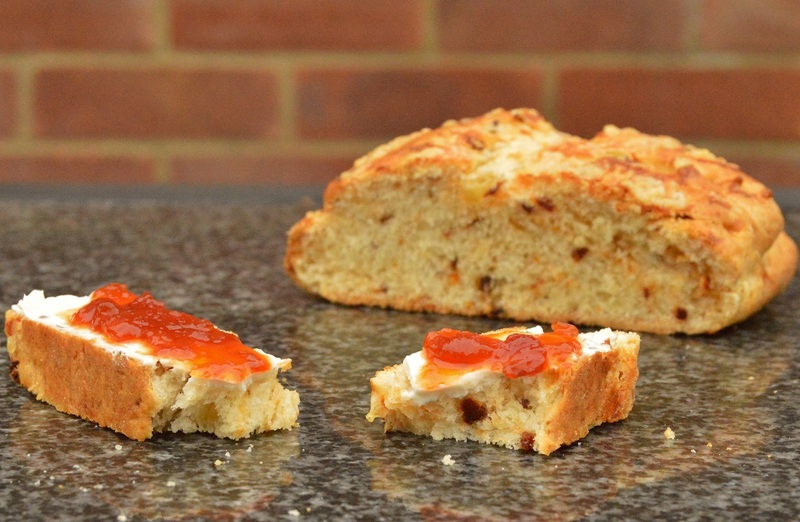 or as larger scones as a savoury twist to an Afternoon Tea selection. I also like to split the dough into 3 equal pieces and make 3 large scone rounds, to be sliced as you would bread – as in the picture below. Scones are best eaten on the day they are made or the day before if you warm them up before you want them. However, they can be made and frozen (unfilled). Simply defrost them, slice them and spoon the filling onto each half if you want to serve them “open”. Alternatively, spoon the filling on the bottom halves and pop the scone tops back on. You then heat them in the oven at about 190C (fan) for 5 minutes or so: the filling/topping doesn’t ooze out but merely softens a little as it heats: the cream cheese takes on a rich thick sauce texture that is, I think, lovely. (1) Make the scones: pre-heat the oven to 200C (fan). Sift the flour, mustard powder, baking powder and salt into a bowl and rub in the butter until the mixture resembles fine breadcrumbs. Stir in the cheese and the tomatoes. (2) Add most of the milk to form a soft but not too sticky dough. (3) Roll out the dough on a lightly floured surface to a thickness of approximately 2cm, or use the palms of your hands gently to pat it out. Cut out scones using circular cutters, re-rolling trimmings gently (if you over-work the dough the scones will become tough). (4) Place on a baking sheet lined with greaseproof, brush a little milk over the top and sprinkle over a little of the remaining cheese. Dust with a little tomato powder, if using, and bake for approx. 10-12 minutes (4cm scones) until well risen and lightly browned (allow approx. 15 minutes or so for larger scones). Cool on a wire rack. (5) Make up the cream cheese filling: mix the cream cheese with the mustard whichever herb(s) you are using and the garlic, if using. Add enough seasoning to taste: you should have a very flavoursome mixture. 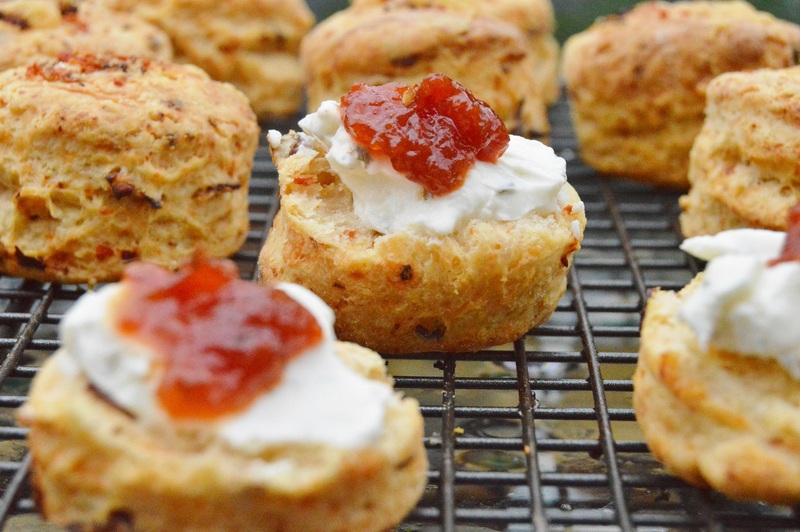 (6) Split each cooled scone in half and top with a small dollop of the cream cheese mixture, a small spoonful of the chutney or chilli jam and a generous sprinkle of tomato powder if using. Replace the tops or leave “open”. Thank you Philip for explaining. I reckon then i have been working my dough too much then I was doing it for about 10 minutes and found that it was not rising so well when i was making the croissants and kouign amann. Also I keep my fresh yeast in a little jar in the fridge perhaps the cold is killing it not sure if this is the reason too. Previous Previous post: The simplest, quickest sourdough flatbreads in about 20 minutes!